Born in Vermont and raised in Lincoln, Sherman Adams graduated from nearby Dartmouth College as president of the famous Dartmouth Outing Club. After serving with the Marines in World War I, Adams became involved the lumber industry. A few decades later, Adams was elected New Hampshire Congressman and later Governor. 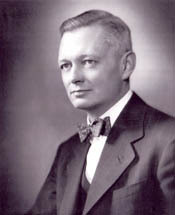 After two terms as Governor, Adams was chosen as President Dwight Eisenhower's Chief of Staff and was considered perhaps the most powerful figure in the Eisenhower administration prior to his 1958 resignation. In the 1960s, Adams looked to develop a ski area in the White Mountains. After apparently passing on Sawyer River Skiway, Adams settled on Loon Mountain. Construction was in full swing by 1965, with Adams taking an active role in the work effort while constantly traveling around the mountain in his Jeep. Loon opened in December 1966 and enjoyed sustained growth thereafter. In the early to mid 1970s, when the New England ski industry was hit hard by energy issues as well as some poor winters, Adams organized ski area operators and used his leverage to obtain government assistance. Adams underwent heart surgery in January of 1985. After a period of frail health, Adams died on October 27, 1986 at the age of 87.